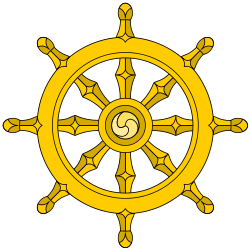 The Chinese Buddhist Canon (大藏經 Dàzàngjīng) (Japanese: 大蔵経 Daizōkyō; Korean: 대장경 Daejanggyeong; Vietnamese: Đại tạng kinh) refers to the total body of Buddhist literature deemed canonical in Chinese, Japanese, Korean, and Vietnamese Buddhism. The traditional term for this canon is Dàzàngjīng (大藏經), which means the "Great Treasury of Sūtras." The Chinese Buddhist canon includes Āgama, Vinaya and Abhidharma texts from Early Buddhist schools, as well as the Mahāyāna sūtras and scriptures from Esoteric Buddhism. There are many versions of the canon in East Asia in different places and time. An early version is the Fangshan Stone Sutras (房山石經) from the 7th century. The earlier Lung Tripitaka (龍藏), Jiaxing Tripitaka (嘉興藏), and Zhaocheng Jin Tripitaka are still completely extant in printed form. 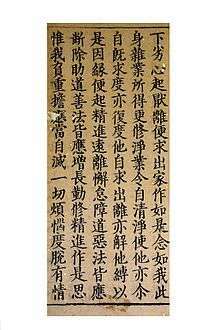 The complete woodblocks are the Tripiṭaka Koreana and the Chenlong Tripitaka. The Tripiṭaka Koreana or Palman Daejanggyeong was carved between 1236 and 1251, during Korea's Goryeo Dynasty, onto 81,340 wooden printing blocks with no known errors in the 52,382,960 characters. It is stored at the Haeinsa temple, South Korea. One of the most used version is Taishō Shinshū Daizōkyō (Taishō Tripiṭaka, 大正新脩大藏經). Named after the Taisho era, a modern standardized edition originally published in Tokyo between 1924 and 1934 in 100 volumes. It is also one of the most completely punctuated tripitaka. 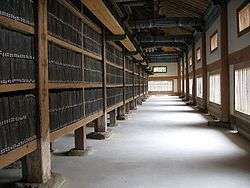 The Zokuzōkyō (Xuzangjing) (卍續藏) version, which is a supplement of another version of the canon, is often used as a supplement for Buddhist texts not collected in the Taishō Tripiṭaka. The Jiaxing Tripitaka is a supplement for Ming dynasty and Qing dynasty Buddhist texts not collected., and a Dazangjing Bu Bian (大藏經補編) published in 1986 are supplements of them. The Chinese Manuscripts in the Tripitaka Sinica (中華大藏經–漢文部份 Zhonghua Dazangjing: Hanwen bufen), a new collection of canonical texts, was published by Zhonghua Book Company in Beijing in 1983-97, with 107 volumes of literature, are photocopies of early versions and include many newly unearthed scriptures from Dunhuang. There are newer Tripitaka Sinica projects. Mostly written in Classical Chinese. The Mi Tripitaka (蕃大藏經) is the Tangut canon. Eric Grinstead published a collection of Tangut Buddhist texts under the title The Tangut Tripitaka in 1971 in New Delhi. The Taishō edition contains classical Japanese works. The Dunhuang edition contains some works in old Western Regions languages. The Tripitaka Sinica mentioned above features a Tibetan section. A number of apocryphal sutras composed in China are excluded in the earlier canons, such as composed stories the Journey to the West and Chinese folk religion texts, and High King Avalokiteshvara Sutra. Modern religious and scholarly works are also excluded but they are published in other book series. (Chinese)CBETA Project (with original text of Taisho Tripitaka vol.1-55, 85; the complete Zokuzokyo/Xuzangjing, and the Jiaxing Tripitaka).